Here at Greenland or Bust, we are incredibly excited about the coming year. First off, registration for Storm Gathering USA starts on Monday! This three-day event is based off the other event that we organize, the UK Storm Gathering. The website is up and running, with complete event information, including coaches, sponsors and the schedule. Check it out, and ask us if you have any questions. Another major thing that’s coming up is our attempt to circumnavigation Jamaica. We fly there on Dec 28, meet up with Wes Moses and spend the next few weeks paddling around the place. Special thanks to our awesome sponsors for supporting the expedition! 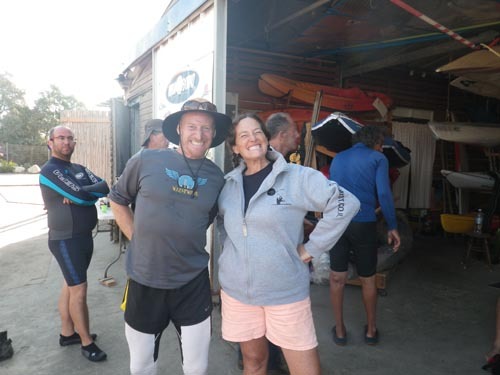 Helen will be using gear provided by Kokatat, Snap Dragon, Barz Optics, WindPaddle Sails, Outdoor Research and Joe O’ Paddles. 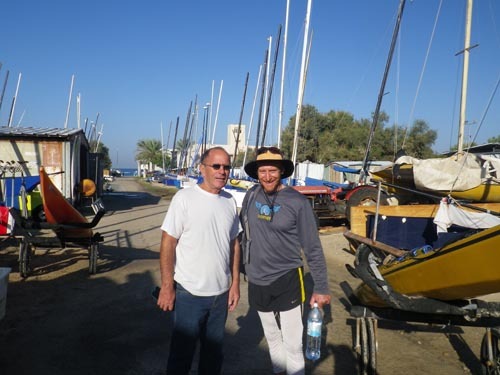 Mark and Wes will be using gear provided by Kokatat, Snap Dragon, Barz Optics, WindPaddle Sails and Celtic Paddles. In other news, we are putting together our 2015 Rebel Kayaks sponsored Nordic Tour. We have confirmed classes scheduled in Sweden, Denmark and Norway. The tour will be from May 23 to August 30. The complete schedule will be posted in early next year. We are also guiding an expedition in Antarctica from December 31, 2015 to January 27/28, 2016. Wanna go with us? E-mail us at info@greenlandorbust.org for details. Storm Gathering USA, planning Jamaica and setting up the Nordic Tour have kept us really busy throughout November, although we did have time for a few other activities. Helen led a Traditional Skills Paddle, a surf and crabbing session and did a presentation titled “South Greenland Expedition and the Greenland National Kayaking Championship” for our local kayaking club, Explore North Coast. 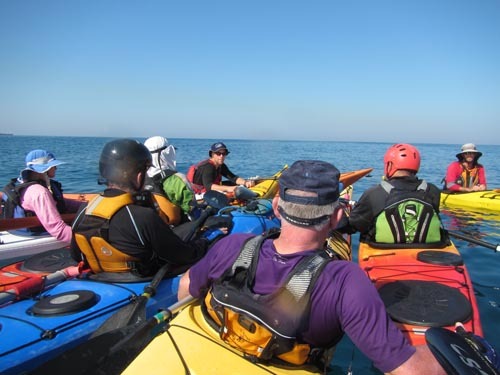 Mark ran two Canoe Wales ‘Coaching Matters’ programs – “Who’s Leading Who” and “Overcoming Anxiety With Action,” as well as BCU 4 Star courses on Anglesey, Wales. In December, we have Simplifying the Roll classes taking place in Dana Point and Marina Del Rey. We’ll also be spending some time catching up with family before heading to Jamaica! We hope that you have a fantastic Holiday season. Don’t forget to register for Storm Gathering USA on Monday. That’s one water based party you don’t want to miss. As usual, visit www.greenlandorbust.org for more information and our current Events calendar and Blog postings. For questions, comments or to schedule us in your neighborhood, e-mail info@greenlandorbust.org. Paddling performance is said to be influenced by the interaction of technical, tactical, physiological and psychological factors (TTPP). This ‘TTPP components model’ (BCU, 2006) can be used to structure long-term practice and help individuals identify which dimension(s) may need further development in order to achieve optimal performance on the water. Technical represents the individual skill that, when executed well, forms the technical template of ‘best practice’ for a stroke. Tactical represents how we apply those skills in any given environment through our understanding of timing, angle, edge, trim, speed, cadence, use of water features… and so on. Physiological represents a paddler’s endurance, flexibility, strength, ability to hydrate and balance nutritional needs. Psychological represents our ability to overcome anxiety, manage arousal, determine self-belief / confidence and motivational reasoning. Being able to assess obstacles within each factor can help us adopt the right tools and tactics, such as goal setting, variation of practice, strength endurance use of imagery and self talk to help us achieve the greatest gains in overall performance. Future newsletters will highlights some of the strategies we can use to develop each domain. Stay tuned! Here at Greenland or Bust, November is often one of the busiest months of the year. Although we’re home, and it may appear that we’re not actually working, we’re really busy making plans for the coming year, and there are LOTS of exciting things on the schedule. First off we’re super stoked to be attempting a first time circumnavigation of Jamaica with Wes Moses. The three of us will launch on Sunday, Dec. 28 and paddle through most of January. We’re looking forward to lots of water time, as well as just enjoying Jamaica. In other works, we’ll be doing another Rebel Kayaks sponsored Nordic Tour. We currently have classes confirmed in Sweden, Denmark and Norway. The tour will take place during the summer months, with a break in the middle to travel to Sisimiut, Greenland to participate in the 30 year anniversary of the Greenland National Kayaking Championship. The complete tour schedule will be posted in early 2015. We’re also guiding an expedition in Antarctica from December 31, 2015 to January 27/28, 2016. Wanna go with us? E-mail us at info@greenlandorbust.org for details. With all of this exciting stuff coming up, it’s nice to take a step back to reflect on the past month. Helen headed up to Pacific City, Oregon to teach at Lumpy Waters. This is a really great event, and Paul, Suzi and Dave do a wonderful job of putting it all together. If you haven’t made it to this one yet, it should be on your list for next year. Helen also hopped over to Israel to teach at Optimist’s Symposium. This was her fifth year at the event, and it was great to catch up with the paddling community from that part of the world. 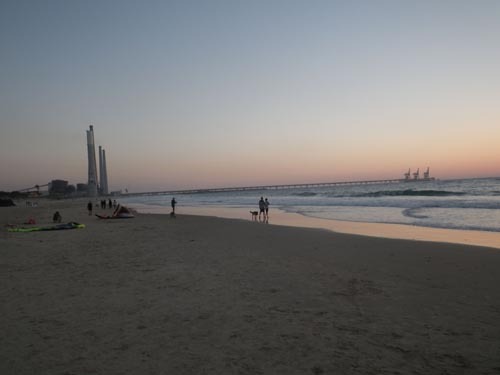 Israel is an incredible place with friendly people, warm water, unbelievable city ruins and quite possibly Helen’s favorite food on the planet. 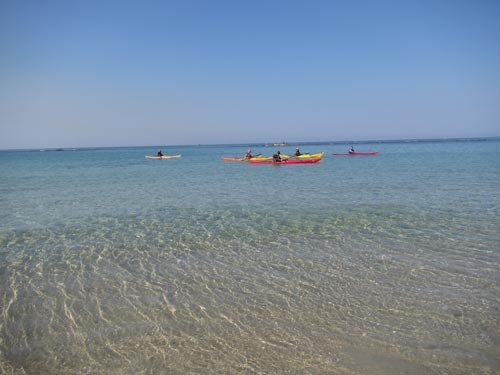 While Helen was doing all of this, Mark was running a BCU 4 Star Sea Training and BCU 4 Star Sea Assessment on Anglesey in Wales, as well as providing some regional coach development programs for Canoe Wales. He was also one of the guest coaches at the DGI’s Autumn Coach Conference in Holbæk, Denmark. Coming up in November Helen will be presenting in Eureka, California on South Greenland Expedition and The Greenland National Kayaking Championship. Other than that we’re spending the month working on putting together all of the exciting things that are planned for the coming year. In December we’ll be leading a trip out of Crescent City, California, then heading south to run classes in Dana Point and Marina Del Rey. We’re looking forward to spending part of the holidays with family and then flying over to Jamaica to meet up with Wes and paddle around the place. With so much going on, it’s hard not to get excited. Don’t forget to put our Storm Gathering USA event on your calendar! As usual, visit www.greenlandorbust.org for more information and our current Events calendar and Blog postings. You can also find us on Facebook, Twitter and YouTube. For questions, comments or to schedule us in your neighborhood, email info@greenlandorbust.org. Happy paddling! Most kayakers live close to one or more bodies of water, and many of us get into the routine of paddling out of the same spot, time after time. Depending on weather and water conditions, that same spot might change personalities frequently, which is why we don’t get bored with paddling the same paddle over and over again. I love Israel. There’s simply no other way to put it. This was my fifth year traveling to Israel for Optimist’s Symposium, and once again it was an absolute blast. 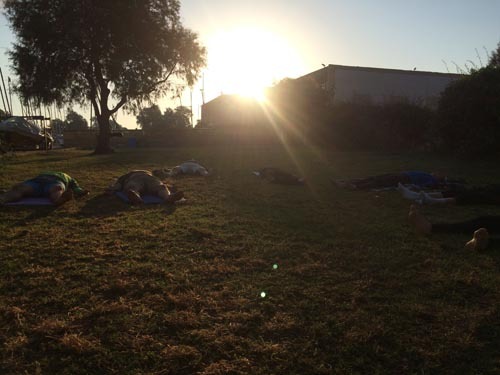 Yoga for Paddlers took place each morning of the four-day event. Ehud and Ben catch up before classes begin. 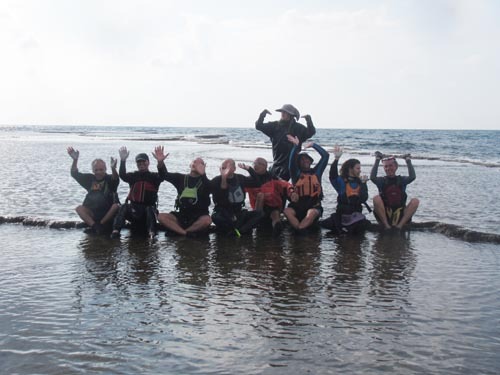 It’s a real treat to run rolling classes in the warm, clear water of the Mediterranean Sea. No hoods needed! 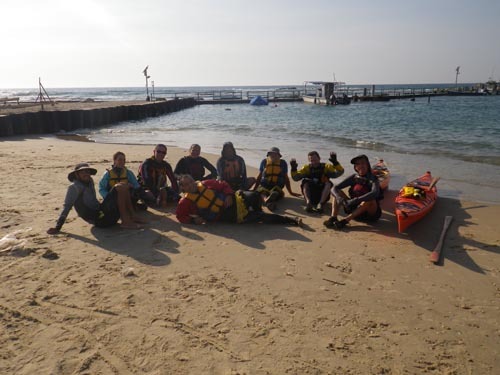 My rolling class demonstrates correct hand position while we take a break on a stunning reef. Another great spot to take a break, right next to the ruins of the old city in Caesarea. After lunch we did some indoor stroke work before putting it into practice on the sea. Meanwhile, other guest coaches, Ben Lawry and Ali Donald, had classes of their own. 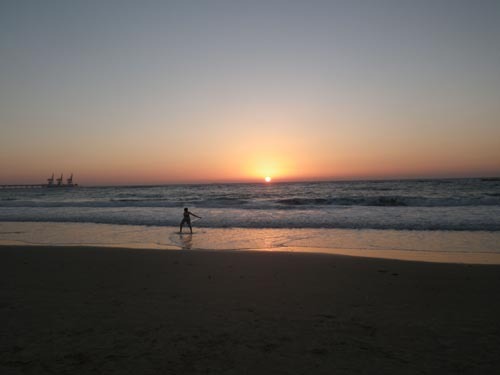 It’s hard not to be mesmerized by the picture perfect beach. It’s always great to see Hadas. Ben isn’t so bad either. 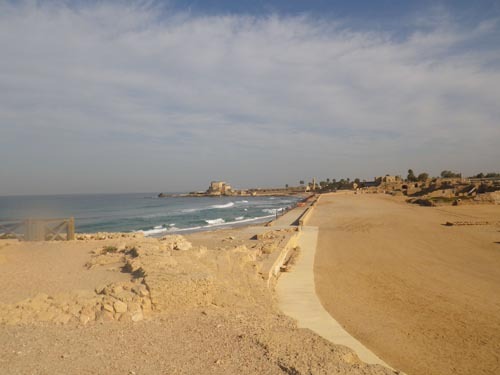 The old city in Caesarea. After the symposium we headed to Jerusalem to explore the old city and marketplace. 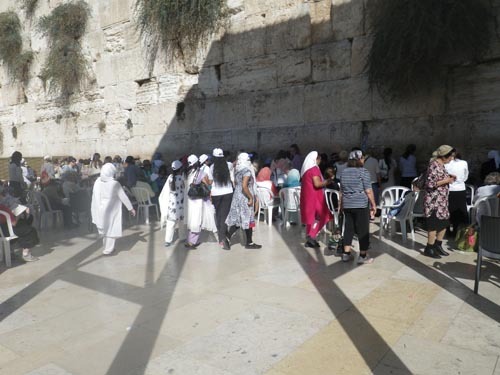 The Western Wall is an amazing place with an incredible energy surrounding it. Now I’m back home and feeling relaxed after a wonderful trip. Special thanks to the organizers, Ehud, Avigail, Yosale and Hadas for once again having me at your event. I’m looking forward to seeing you all again soon in the near future. Photos by Zohar Navon and myself.